This is an obvious tip, but one that folks sometimes don't consider enough. Spring, summer, and even fall are great seasons to take your dog out on sunny walks, but be mindful of the temperature and when and where you walk him. 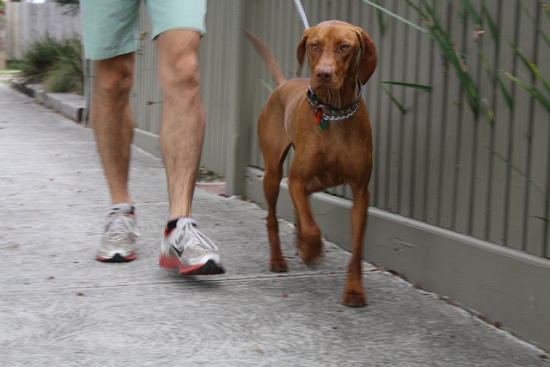 The best time to walk your dog is in the morning or late evening, when the pavement is cool. Avoid walking your dog in the afternoon or early evening when it's hot outside, because the pavement will be its hottest. During cool times of the day, you should walk your dog on pavement, because the hard and rough surfaces will toughen the pads on your dog's paws. This will help to make her pads tougher, providing a natural resistance to damage from hot surfaces. If you end up taking your dog out during the warmer times of the day, be sure to stay on the grass and stick to shady areas. Stay away from sidewalks or any paved areas to avoid burning. A shady park can be a great place to take your dog on a warm afternoon. You want your dog to have tough paws, but you don't want them to get too dry or they will be more susceptible to cracking, peeling, and cuts. These dry signs in your dog's paws can also make them more susceptible to burns from hot pavement. Consider moisturizing your dog's pads daily, especially in hot weather, to help prevent injuries and burns. Paw Nectar is a highly-rated, 100 percent natural, treatment for dry, cracked paws. Use it regularly. It will not hurt your pup if he licks it. Paw Nectar can also be used on a dog's dry or cracking nose. Dog shoes are a good way protect your dog's paws from all kinds of harmful surfaces and potential injuries if your dog will wear them. Also, they must fit her properly or they might pose a danger. Be aware that not all dogs can get used to dog shoes, and some might have a hard time walking in them. Make sure you get the right size and purchase shoes with rubber or neoprene soles, as they are most protective against damaging surfaces. There will definitely be an adjustment period for your dog trying to walk with dog shoes on, but if you can get your dog used to using them, they could be a solution for hot and cold weather hazards. You might want to read this article on how to encourage your dog to wear shoes. A big favorite among dog owners is the Bark Brite set of All-Weather Neoprene Paw Protector Dog Boots. There are instructions for measuring your dogs' feet at this link. They have reflector straps, which is a bonus feature. Boots or any other paw or foot covering should be kept on as short a period of time as possible. Dogs "perspire" through their mouths and their paws. When dogs' paws are free, their perspiration allows their body heat to adjust. All-terrain boots are similar to other dog boots, but they are more rugged and, generally, more expensive. But if you have an active, athletic dog and she hikes, runs, loves the snow, sand, water, and well... hot pavement... the cost of the boots are well worth it. Canine Equipment's Ultimate Trail Dog Boots are made of recycled rubber and have snug wrap-around closures. They are available in five sizes (see link for measuring instructions), but the front pair and back pair are differently sized so they match the true proportional size of your dog's feet! Remember, take them off whenever you can, so your dog can adjust her body temperature by having her feet exposed to the air. And don't keep foot coverings on inside the house if you can help it. Dog socks are intended for indoors and are a last resort solution if you need to take your dog onto the hot pavement. Make sure the socks have rubber or neoprene soles or your dog will burn his feet. Sock soles are much thinner than shoe soles, so make your sock-walks very short. Don't use disposable shoes. They are made of rubber or silicone and fit tightly so there is no room for your dog's feet to breathe. Additionally, they do not provide any barrier to heat or cold. The temperature beneath them goes right through to your dog's feet. And don't use any product that sticks to your dog's foot. You don't want anything to rip the skin on your her foot pads. I didn't believe them either, but there is a solution designed for dogs who won't wear their shoes and socks. It's called Canine Footwear Suspenders Snuggy Boots. Actually they are adjustable suspenders and they don't come with snuggy boots, or any boots, but if your dog really needs to wear boots to protect him from the hot pavement or any other surface, these suspenders may be worth a try. Be sure to check your dog's paw pads daily for any signs of damage and check between his paw pads for any stones or other debris; pull them out gently. You can wipe his paws off with a room temperature damp cloth before moisturizing the pads of his feet with Paw Nectar. If you do happen to see a problem, or if your dog is acting strangely on his feet, be sure to take him to the vet. 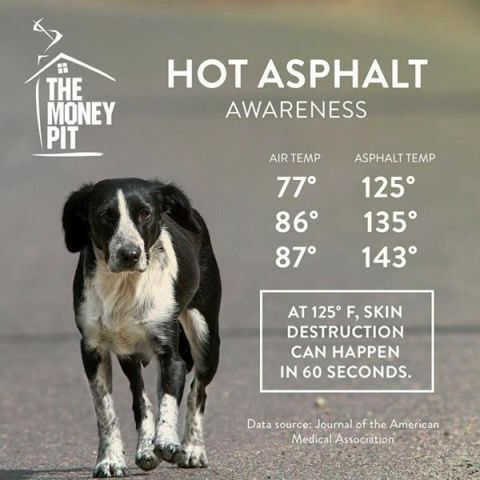 These 10 tips will help your dog stay safe and uninjured this summer from the dangers of hot pavement. Be sure to keep a close eye on your dog to protect her from any other heat related injuries as well. Make sure you watch for Symptoms of Heat Stroke In Dogs. Also, consider these 12 Quick Tips For Keeping Your Dog Cool In Summer. 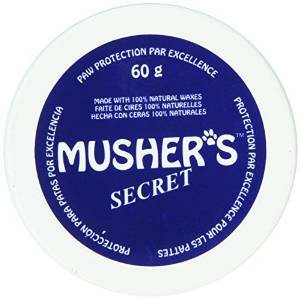 As mentioned earlier, here's a product review video for Musher's Secret if you're interested. You can buy the paw protection wax here and I can't recommend it highly enough. With my tips on keeping your doggie's paws protected and on getting a great life vest for your dog if you are heading for the water should keep your buddy safer and more comfortable this summer. Happy Summer! Originally published July 2012 and updated May 2017..